Sometimes astrologers forget when teaching someone new to astrology the absolute basics required to learn. You do them so often, they become second nature, and you forget that you need to learn these things first before you start anything else. This is a totally basic exercise and shows you how to count degrees and therefore helps you find aspects and understand the zodiac wheel. 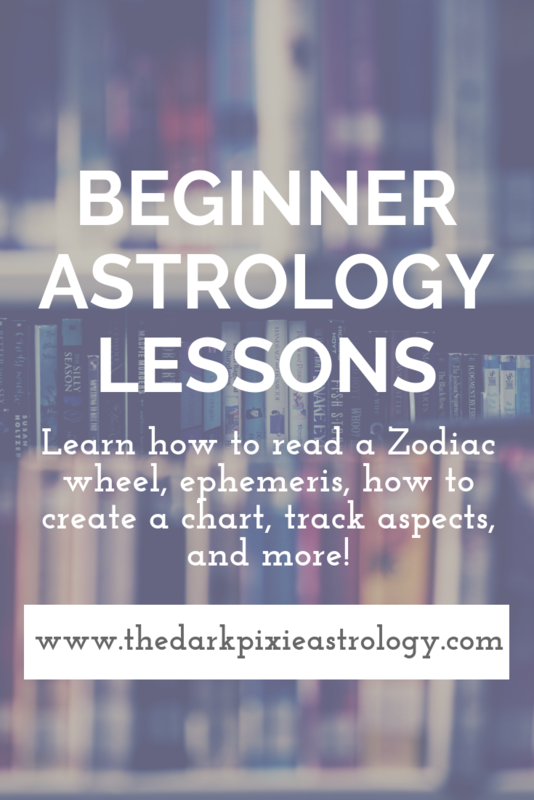 If you're completely new to astrology, it's one of the first things you must learn. Take a plain piece of paper and draw a circle on it as best you can (or just trace something circular, or use a compass). Make it as large as the page will allow. Draw lines through the circle like you would cut a pizza, and make 12 even "slices". Make the lines either bold or in a different color from what you'll do next. Each "slice" contains each sign of the zodiac. Label each slice counterclockwise (left to right) with each zodiac sign in order, Aries through Pisces (so Aries, Taurus, Gemini, Cancer, Leo, Virgo, Libra, Scorpio, Sagittarius, Capricorn, Aquarius, Pisces). Each slice contains 30 degrees, so it's like each slice is then sliced into 30 more slices. Draw 29 slashes for each slice on the outer edge of the circle (or you could just do 5 slashes and have each represent 5 degrees). The bold lines you drew to make the 12 slices are each 0 degrees. Label them. Count the slashes (remember, counterclockwise) as 1 degree, 2 degrees, 3 degrees, 4 degrees, and so on (unless you did the 5 slashes representing 5 degrees, then it would be 5 degrees, 10 degrees, 15 degrees, and so on), until you get to 29 degrees (you can label them too, every 5 or 10 degrees). Then you start over at 0 degrees of the next sign. Continue until you've done all twelve signs. Now, if you'd like, you can chart points on the wheel, like from your own chart. Say your 1st house starts at 12 degrees Taurus. Find that point on the wheel and draw a line through it. That marks the beginning of your 1st house. Say your 2nd house starts at 15 degrees Gemini -- find that point and draw a line through it. That marks the beginning of your 2nd house, and everything between the 1st line and 2nd line is the 1st house. Draw a line through the position of your 3rd house, and everything between the 2nd and 3rd lines is the 2nd house. Now you can see how houses work. Next, you can plot your planets. Say your sun is at 20 degrees Taurus. Find that spot and mark it (a dot, a star, write 'sun', whatever you'd like). You'll be able to see that the sun falls in the 1st house since it's between the 1st and 2nd lines. Do this for all your planets, and you can see how a chart takes shape for yourself. 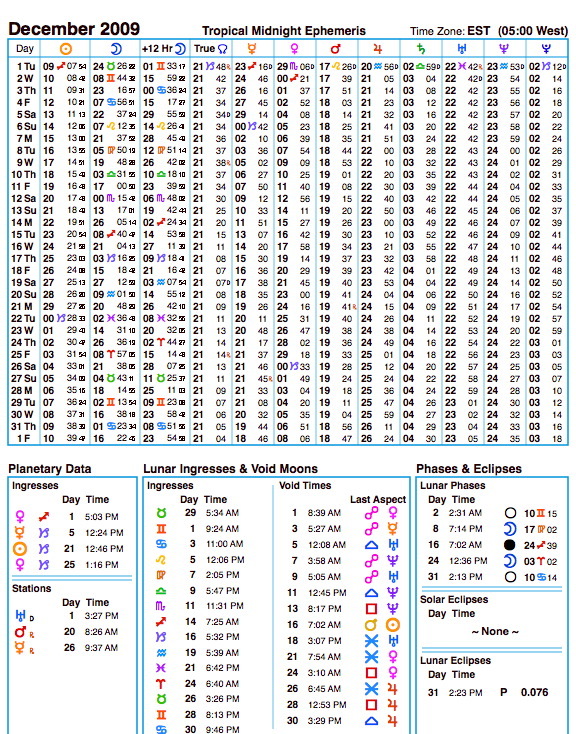 How to read an ephemeris is a crucial part of astrology and predictions; knowing how to do this allows you to see where the transit (moving) planets are in your own chart and what natal planets they're aspecting. For this exercise, we're going to use an ephemeris for December 2009. There are lots of free places online that offer a free ephemeris, so once you know how to read one, you can use whichever you prefer or buy one. For now, we'll use this one to the right, from www.artcharts.com. In the first row you'll see a bunch of glyphs that probably look familiar; they are the glyphs for each planet. In order, they are the sun, moon, then the moon 12 hours from the start of the day (+12 Hr), True Node, Mercury, Venus, Mars, Jupiter, Saturn, Uranus, Neptune, and Pluto. At the top of each column is a glyph standing for a zodiac sign - this shows which sign the planet is currently moving through. The numbers in each column show where exactly in the zodiac sign the planet is positioned. There are numbers to the left and numbers to the right of the zodiac sign. The number to the left is the degree and the number to the right is the minute the planet is located in the zodiac (each zodiac sign is made up of 30 degrees and each degree is made up of 60 minutes, so the numbers to the left will always be 0-29 and the numbers to the right will always be 0-59. There are times where you'll also see a 2nd set of numbers to the right of the sign, which are seconds. Each minute is made up of 60 seconds. On this ephemeris, the only columns that have seconds are the sun and moon). If you aren't already, become familiar with the glyphs for each zodiac sign. Visit the THIS page for a list of astrological glyphs. Now let's start reading the ephemeris. We'll start with the Sun column. The sign at the top of the column is the glyph for Sagittarius. To the left is the number 9 and to the right are the numbers 07 and 54. From this we can gather that on December 1st, the sun was located at 9 degrees 7 minutes 54 seconds in Sagittarius. The next day, on December 2nd, the sun was located at 10 degrees 8 minutes 42 seconds in Sagittarius. On December 3rd, at 11 degrees 9 minutes 31 seconds in Sagittarius. As you scroll down the column, you'll see the numbers continue to increase, building until it reaches the next sign of Capricorn. Now go over to Mercury - you can see Mercury also starts in Sagittarius, at 23 degrees 16 minutes Sagittarius, and eventually moves into Capricorn. Move to the next column, Venus, and see that Venus starts in Scorpio at 29 degrees 6 minutes. Do the same with all of them. You'll see the letters 'R' and 'D' also there (R is in the True Node, Mercury, Mars, and Uranus columns, the little red letter to the right of the numbers). Whenever you see an 'R' the planet is retrograde, or moving backwards (in relation to us), and a 'D' stands for direct, meaning it is no longer moving retrograde (backwards) but is moving direct, in forward motion. For the month of December 2009, three of the ten planets were/went retrograde (Mercury, Mars, and Uranus). Planetary movement through the houses means when the transit (moving) planets enter a new house in your chart. There are 12 houses in a chart, and they each rule different things, and when a transit planet enters a house, it brings its energy to the areas of life that house rules, making the house more prominent in your life. This is one of the most important things to do for predictions and can be done in a few hours, so you can do it in one sitting or over the course of a few days. All you need to do is write down the dates in which each planet enters a house. I advise writing it out in columns. Start with the Sun. For this exercise, see what position the Sun was at on January 1st, 2009 using an ephemeris (you can purchase one at a store, or find one online for free; I recommend astro.com, though you need Adobe Reader; 2009: http://www.astro.com/swisseph/ae/2000/ae_2009.pdf). For January 1st, 2009, the Sun was at 10 degrees 42 minutes in Capricorn. Find where that is in your chart, and that's your starting point. To find where it is in your chart, you need to find between which 2 houses the location falls between. Say your 3rd house cusp is at 2 degrees 19 minutes in Capricorn and your 4th house cusp is 3 degrees 30 minutes in Aquarius. Where the Sun is located falls between your 3rd and 4th house cusps, so it's in your 3rd house. Doing this will give you the exact dates each planet will be in each of your houses. This will help you tremendously with reading horoscopes. Most horoscopes only apply to you if every single one of your houses are at 0 degrees, so the timing for when they say things can happen is usually a bit off (it's also advised you make sure you're reading your rising sign, since that's what determines the houses, not your sun. Your rising sign is the sign on the 1st house cusp.). This way when you read a horoscope and it tells you something about maybe Mars in the 5th or Venus in the 10th, you'll know exactly when the effects of that placement will begin to show for you specifically. Aspects made by transit (moving) planets to natal planets are very important in prediction. Tracking your aspects is fairly simple but takes some time to record since there's 9 transit planets (you don't have to do the moon) and 10 natal planets (including the moon). Starting out, you need to only look for the "major" aspects: conjunction, sextile, square, trine, and opposition. A conjunction is when a transit planet is at the exact same position in the zodiac as your natal planet (ex: transit Sun at 16 degrees 25 minutes Gemini and your natal Mercury is at 16 degrees 25 minutes Gemini). A conjunction can be positive or negative depending upon the other aspects involved. The best way to put it is that with a conjunction, if the other aspects are good, it'll make it better, and if the other aspects are bad, it'll make it worse. Sextiles are considered good aspects. They tend to require you to do some work though; the good things won't just come to you. You'll often see the word "opportunity" associated with sextiles. Squares are considered "negative" aspects. They do tend to bring problems, but there is always a way to learn from them. Think of squares as the aspect equivalent of Saturn, and remember that in astrology, there is always a high (positive) and low (negative) vibration to every aspect, so even if you see squares or oppositions in your natal chart or happening to you with the transit aspects, know that you can always make the best out of it (and quite often if you do, the rewards are even bigger!). Sit down with an ephemeris and write down your aspects. You want to write down when the transit Sun, Mercury, Venus, Mars, Jupiter, Saturn, Uranus, Neptune, and Pluto makes these aspect your natal Sun, Moon, Mercury, Venus, Mars, Jupiter, Saturn, Uranus, Neptune, and Pluto. Remember you only have to write down the dates the aspects are exact. That makes it a bit easier since you only have to skim through the ephemeris to find the right signs and match the numbers up. Tracking your aspects will really help you to see how certain planets and certain aspects affect you, because they affect everyone differently. Look at your chart and see what sign is on your 1st house cusp. If you're an Aquarius rising, then Uranus is your 1st house ruler; Libra rising, Venus rules; Aries rising, Mars rules, etc. You can do this for each house cusp to see which planet is the house ruler. Some houses will have 2 rulers though (unless you use equal house system). This occurs when a sign is completely contained in a house. Example: say your 5th house cusp is at 28 degrees 15 minutes in Leo and your 6th house cusp is at 2 degrees 7 minutes in Libra. You went straight from Leo to Libra, skipping over Virgo. This means that Virgo is completely in the 5th house (called intercepted), and so the 5th house has a ruler of the Sun (rules Leo) and a co-ruler of Mercury (rules Virgo). House rulers are very important in prediction, and are directly affected by aspects made by transit planets to your natal planets because your natal planets are your house rulers, meaning that whenever a transit planet aspects your natal planet, it also aspects the house(s) that the natal planet rules. (So let's say the transit Sun is sextiling your natal Venus, and your natal Venus rules your 7th and 11th houses. Not only do you have the aspect of Sun sextile Venus, but you also have the aspect of whatever house(s) Venus rules, in this case Sun sextile your 7th (relationships) and 11th (friendships, groups, wishes) houses. A house ruler is the planet that rules the zodiac sign on the cusp of a house. In prediction, aspects made by transit (moving) planets to the house ruler affect the areas of life the house rules. In your natal chart, you can also use house rulers to find linkages between the houses to further understand how your chart (and life) works. Find the ruler of your 1st house. For example, we’ll use Leo on the 1st house cusp, making the Sun the ruler of the house. Now find where the planet is located in your chart. Let’s say the Sun is located in the 3rd house. That ties the 1st and 3rd houses together. This can show that siblings have an important position in your life, writing and communicating are important interests, or that you’re involved in your local community (all 3rd house related). Find the ruler of your 2nd house. In our example, Virgo would likely be the sign on the cusp, so the ruler would be Mercury. Now find where the planet is located in your chart. For this example, we’ll say Mercury is in the 5th house. The 2nd and 5th houses would be tied together. This can show someone who makes money (2nd house) through creative ventures, sports, a hobby, or working with children (all 5th house related). You can do this for all of your houses to see how they tie together. In cases where the house ruler is in the house it rules, that can show harmonious and almost pure energy associated with the planet and house. Most often when astrology beginners see an empty house, they think that means something’s wrong; so many with empty 5th houses (house of love) or 7th houses (house of marriage) initially think they’ll never find true love or never get married. Not true! Let me repeat: NOT TRUE!!! Just trying to get your attention there. An empty house doesn’t mean there’s less emphasis on that house in your life, and that you’re doomed to have whatever part of life that house rules “missing” from your life. At various points, transit (moving) planets will tour through your empty houses, and during that period, it will become more important, and whatever issues need to be resolved with it will be brought up then, instead of having the issues there all your life to be worked out. Some believe that an empty house signifies that you worked out most of the issues of that house in your past life/lives, so you don’t need to focus on the issues as much in this life; this doesn’t mean it’s not a part of your life, just usually not a part of the problems of your life. Since there are ten planets and only twelve houses, at most a person can have ten houses occupied and a minimum of two empty houses; it usually is more than that, with most having at least one or two houses with two or more planets. If you have many empty houses (like you have a couple stelliums and so your planets are bunched in just a few houses), that can show you only need to put your focus on a few, particular areas of your life for issues. Now, if you deal with stuff like asteroids, then in reality, nobody has a truly empty house, because there are THOUSANDS of asteroids, so at least one of those little guys would fall in an empty house. There are many astrologers who don’t like asteroids and don’t use them; I do like them but normally don’t use them much in readings since there’s just too many of them. But I don’t think they should be discarded, and even a tiny bit of energy like that of an asteroid can have an impact. When you want more information on the part of life that house rules, you just have to investigate the sign on the house cusp, which will be the prevailing energy associated with that house. Also see the ruler of that house, where it’s located, what sign it’s in, and what aspects it’s making for further insight.